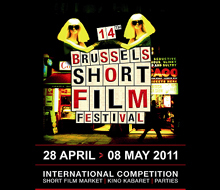 My first short True Colours won two prizes at this festival in 2007: Best Short (Youth Jury) and Best Actor (Neil Maskell). I spent 5 days in Brussels, saw a very strong line up of international films and made some friends that are still very close today. This festival has a very special place in my heart and it is nothing but the biggest of honors to be able to return there with my latest work.